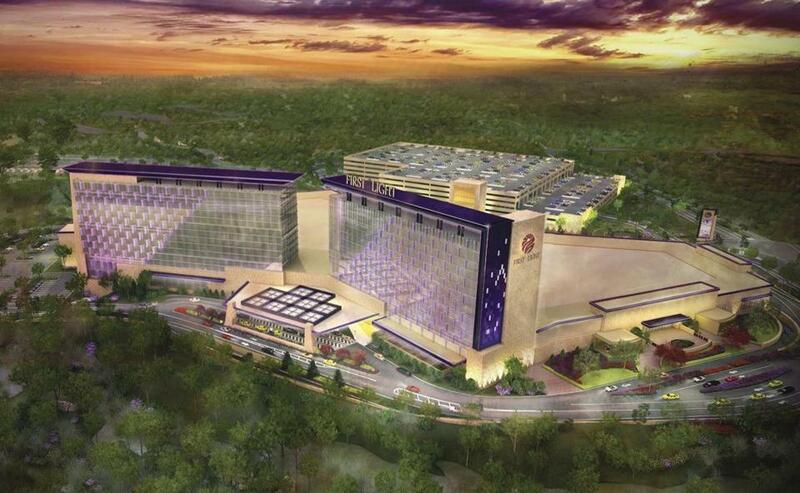 This architectural rendering shows the resort casino the Mashpee Wampanoag envisions building on its reservation in Taunton. A federal judge ruled Thursday that the US government lacked the authority to designate land in Taunton as a sovereign reservation for the Mashpee Wampanoag, dealing a major setback to the tribe’s plans for a $1 billion casino. The Mashpee said the government would likely appeal the ruling, and declined to say whether it would halt construction on the project, which began several months ago. Cromwell said the tribe will work with the Department of Interior to determine how to proceed. The tribe decided to break ground on the casino despite the threat of the federal lawsuit, confident it would not derail the project. A spokesman for the Department of Interior could not be reached for comment. The plaintiffs celebrated the ruling, saying it vindicated their long legal fight. “Judge Young’s decision affirms what we learned and what we’ve been saying over the last four- and-a-half years,” said Michelle Littlefield, who filed suit with her husband, David, and other residents. Littlefield said the plaintiffs fought the federal decision not out of opposition to casino gambling, but to the loss of local and state jurisdiction. She said the plaintiffs are determined to take their case to the US Supreme Court, if necessary. In his ruling, Young agreed that the Indian Reorganization Act authorizes the government to place land in trust for Indian use, but said the law defines Indians as persons, or the descendants of such persons, who were members of a tribe that was recognized at the time the law was passed. The Mashpee first won federal recognition as a tribe in 2007, after a 32-year legal struggle. A 2009 US Supreme Court ruling, known as the Carcieri decision, also seemed to restrict eligibility for reservations to tribes that had an official relationship with the federal government in 1934. Government lawyers argued that the 1934 law is ambiguous, and that deference should be given to the Department of Interior’s decision. Young rejected that position. “The city, along with the tribe, will explore all of our options and we remain hopeful that the project will ultimately go forward, so that the city, its residents, and our region can reap economic opportunity” from the casino, he said. In April, the state Gaming Commission rejected plans for a $677 million casino in Brockton, just 20 miles from the Taunton site. That meant the tribe, which does not require state approval for a casino, would not face competition from another resort casino in the region. Elaine Driscoll, a spokeswoman for the commission, said in a statement the panel was reviewing the decision.